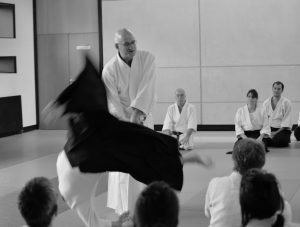 Here is the October 2018 Aikido Update for the Ki Federation of Great Britain. Our apologies for changing the first 2019 date for the 6th, 7th & 8th Dan Group. We set the original date for the Easter Weekend. However, that would have been too busy for members attempting to travel. The new date for that course is 8th June. F. Desportes from Paris, P. King, and G. MacKenzie. If any invitations for Dan Grading in 2019 are missing, or teachers need dates for members to take their re-grade, please contact Sensei Margaret. There are a few spaces available on the Sword courses on the 17th November. The Basic Sword course is in the morning, and the Advanced Sword course in the afternoon. High grades can book by contacting the office. We look forward to seeing our members on the Autumn Seminar this weekend and hope our International members have a good journey. As it is part of a Dan Grading to subsequently make ukemi, it would be helpful if members thought of making ukemi more than one time. Consider the number of Dan grades that helped with your own grading. Our MacMillan Coffee Cancer Support morning raised £680 for their funds. So thank you to everyone who helped.